The Eureka! Chrysalis Hammock was designed by Dave Helsdon of Canada and is currently retailed through Eureka! of Canada and Helsdon Outdoors. It uses a bridge-style design that provides a true head-to-foot flat lay. The wide spreader bars at the head and foot ends keeps the hammock from curling the shoulders too much. A bridge hammock allows the occupant to easily sleep on their side as well as on their back. The upgraded suspension system on the Chrysalis is a nice improvement over the original design and allows the hammock to be easily and quickly attached and adjusted. MANUFACTURER RECOMMENDATIONS Weight limit 250 lbs and length 6’4″ or 115 kg and 193 cm. Eureka! sent me all three components for the Chrysalis hammock, and my first thought was that all three were meant to be assembled together. I first set up the hammock and then added the bug netting. When I pulled out the Camper Sleeve tarp, I quickly realized my mistake, since the Camper Sleeve already has an integrated bug net on the lower half. Yikes! The modular components allow me to set up the Chrysalis with or without the tarp system, use my own preferred tarp, or set up the hammock under a pavilion and just use the bug netting. Eureka! also included a new suspension system with the Chrysalis. The new hook and ladder lock aluminum hardware adds a few grams over the original hardware, but provides more versatility in setting up the hammock. The hook is designed as a quick-release/attach component for the tree strap, but can also be used to clip to an existing anchor or bolt. The ladder lock is a combination tri-glide and hook that allows for quick adjustment and attach point from hammock to strap. The Chrysalis hammock comes with a webbing strap for a ridge line. This ridge line is an important addition for a bridge hammock because if the hammock is pulled too tight it can bow the hammock backwards, creating an uncomfortable sleep. The ridge line sets the appropriate sag for the hammock, but also helps support the bug netting (Tropic Sleeve) and tarp (Camper Sleeve) so they don’t fall down onto the user. The hammock has a double layer of fabric on the bed so that a sleeping pad can be inserted for insulation underneath. The pad sleeve also keeps the pad from sliding around. The steel spreader bars are extremely durable and separate into two sections and have fabric sleeves to protect the ends from coming in contact with the hammock. The spreader bars can be removed. The ends of the hammock have been covered with fabric that creates a pocket on both sides for gear storage. There are no other gear pockets on the hammock, ridge line, or accessories. Both the bug net and tarp accessories are tube style, meaning they must be pulled over like sleeves around the hammock to install. Zippers on the ends of the bug net and tarp seal up the ends and help to form the sleeves around the hammock. Hook-and-loop squares are sewn into the corners of the hammock, just below the spreader bars. Matching hook-and-loop squares are found in the Tropic Sleeve and Camper Sleeve. These hook-and-loop patches help secure the sleeves to the hammock and keep them well-formed. Horizontal zippers are found on both the bug net and tarp sleeves and are located on both sides, parallel to the hammock. The horizontal zippers make it easy to enter and exit. I was able to use the Eureka! Chrysalis Hammock on multiple trips throughout this past summer, resulting in more than 20 nights of camping. All of the trips were “car camping” style so I didn’t have to carry the hammock very far before setting it up. Set-up is made easy with the new suspension. I prefer to keep the suspension separate from the hammock to keep it tangle free; to keep the suspension away from the hammock if it gets gooey with sap; and so I can set up the hammock without having it touch the ground. Some may prefer to keep the suspension attached to the hammock. 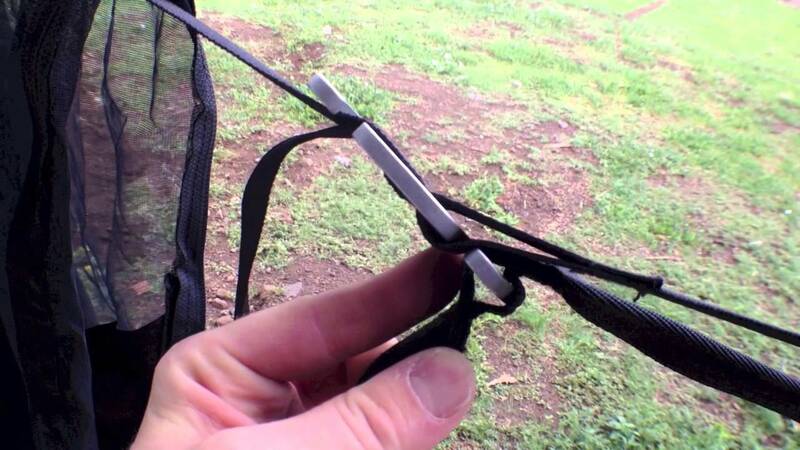 In order to add the bug netting or tarp to the hammock, it may be necessary to remove the suspension and thread it through the sleeve in order to “install” the sleeves. I set up the hammock a few times without the ridge line with mixed results. Sometimes I was able to get a good lay and other times it wasn’t as comfortable. I found that the ridge line is a good accessory for keeping the hammock in the best sleeping shape. This is a very comfortable hammock with a nice lay; however, for folks over 6 ft, it becomes increasingly uncomfortable because the spreader bars can get in the way. The bed is also narrow at the center (29 in/74 cm), so folks with a wide girth may not feel as comfortable. I love how wide the spreader bars keep the fabric body spread around the shoulders and feet. I enjoyed sleeping in this bridge so much that I kept in indoors for several nights as my nightly bunk. The Chrysalis is not lightweight, although it is comparable to some single person polled tents. For me, it is too heavy for backpacking as there are lighter bridge hammocks on the market. But for backyard or car camping, canoe trips, or base camps, it is an easy decision to take it. The suspension system is easy and straightforward and doesn’t require a lot of complicated configurations. My only complaint is that the Camper Sleeve (the tarp) is a little difficult to get on and off. I probably make it harder because I don’t want to place my hammocks on the ground, so to keep the hammock suspended while draping the tarp sleeve around the hammock requires some dexterity. This poses a problem if it is raining if using the Camper Sleeve tarp. One advantage hammocks have over tents is that the rain fly can be pitched first, providing a dry area to set up the hammock. The Camper Sleeve, in contrast, must be set up after the hammock is hung, so the hammock can get wet while the sleeve is pulled over. Is the listed Ridgeline length correct? 212 inches = 17.67 feet. That’s huge! I was wrong. The centimeter measurement was correct but I didn’t convert it correctly. The ridgeline is approximately 10 feet (120 inches) long. Thanks for the edit! I have one of these as well, and I agree with you that this is one comfy hammock. I have read on HF several ways to reduce the overall weight of the unit by half with swapping out strapping for Amsteel, and the steel bars for fixed length aluminum poles from Quest Outfitters (http://www.questoutfitters.com/tent_poles.htm). I will likely do the same for mine. I do appreciate the illustrations, Derek! You’re welcome, and thanks. I agree that there are several mods you can do to make this a lighter hammock. The webbing weighs it down significantly. Tommy, thanks for posting. While I respect your view, my experience is markedly different than what you describe. Did you use the 2013 model? I found mine in great condition, very well-made. I would go so far as to say “bomb proof,” thanks to the thick webbing reinforcement, uniform stitching (no strays), and quality ripstop material. Nothing I saw was inferior. It doesn’t use lightweight silnylon or Cuben fabric by any means. It is built for the mass market, not the lightweight crowd. You may want to qualify your claims of quality. Yes, there are less expensive and lighter bridge hammocks, but there are other qualities people use to determine a purchase. I own all three. The Warbonnet Ridge Runner, for example, is 708 g for the double layer with bug net, not including the poles (284 g). The JRB Bear Mountain Bridge is 707 g plus 242 g for the poles. The Ridge Runner ($195) uses the lightest, less durable fabric than all the models, yet it is heavier than the JRB model ($190). My favorite lay is the Ridge Runner, followed by the Chrysalis, and then the Bear Mountain. However, I won’t loan the Ridge Runner because the material is light and I don’t want anything to happen to it 🙂 The Bear Mountain needs some TLC to make sure the netting doesn’t rip (I loaned it once and the user accidentally ripped the bug net by getting out of the wrong side). The Chrysalis, in contrast, has been roughly treated, and after a season of camping, still looks great and works like new. So, while I may not take it backpacking, I’ll gladly take it on family camps, summer camp, or other base camping adventures. Hey Derek! I found the sleeve pretty interesting. I’m researching right now, and saw the sleeve could possibly be used on another hammock. I was thinking of a gathered end hammock such as the Dream Hammock Freebird, and using the tieouts to help deal with the diagonal lay. For a 10′ hammock, I think the ridgeline would be more toward 9′ though. It would also be about half a pound heavier than a net and tarp set-up, but for ease of use…. Do you think it would work? Have you tried it? I have not tried the Eureka Camper Sleeve on any other hammock, but it could work. You would need to add tie-outs to the four corners to pull the tarp taut. You will also need to add some sort of adjustment on the ends to keep it taut along the ridge line. Oh, and having a ridge line will really help too. quite old thread now but I see this part is still available and discounted now. Do you think it would be feasible to use telescopic trekking poles instead of the spreader bars it comes with to save weight? It may be possible but I’ve never tried it. You’d probably need to adapt a connector to the pole so it fit correctly. Where can I get the hook and ladder lock aluminum hardware? Not many options, but Dutchware.com has something similar with the Dutch Hook.